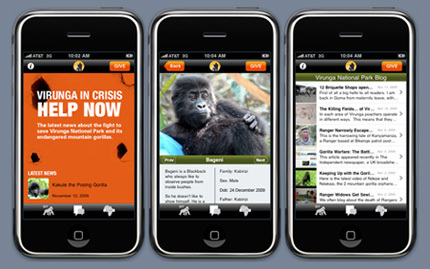 I-SITE is leading the way in iPhone apps for causes with the release of iGorilla, the first app supporting the plight of Africa’s endangered mountain gorilla. The idea for the app came about after CEO Ian Cross traveled to Virunga in 2006 after attending a creative economy conference in Rwanda. On his return Ian reached out to Emmanuel De Merode and Samantha Newport of Virunga National Park to discuss developing a social network for the gorilla families. With the explosion in the number of smart phones worldwide this idea eventually evolved into iGorilla. Since launch in May the app has been featured on the BBC World News and driven a new wave of awareness and support for the cause. iGorilla costs $3.99 with 70% of the proceeds going directly to the park.